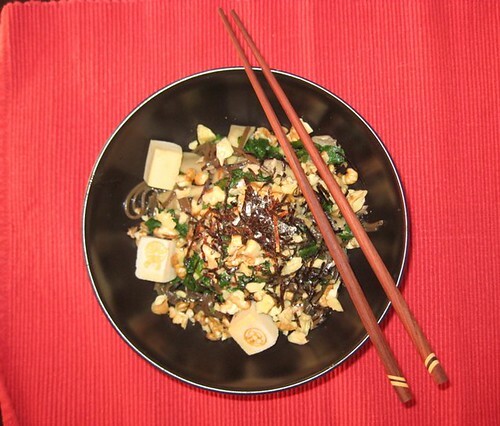 I can’t believe how long it’s been since I last made a bento… But yay, Gnoe’s back on track! So, what vegan goodies did I bring? 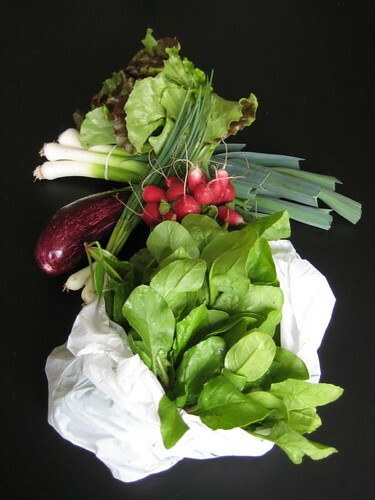 @Petra_Utrecht’s lemony couscous salad, grilled veggies (yellow paprika, fennel, courgette, red onion), garlic olive, raspberries from the balcony, radicchio leaf and romaine lettuce. Spicy roasted chickpeas, gherkin, dried apricots, mushrooms & leek in Bulldog tonkatsu sauce, half a tomato, orange-teriyaki tofu with extra sauce (should have added sesame seeds as topping but alas, I forgot). Melon & homegrown organic strawberry. And here’s what I had on the side. 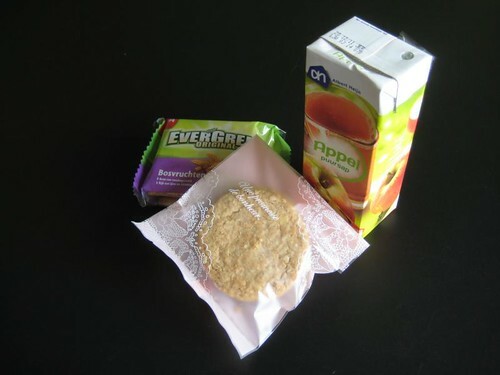 Apple juice, almond cookies and forest fruit Evergreen. 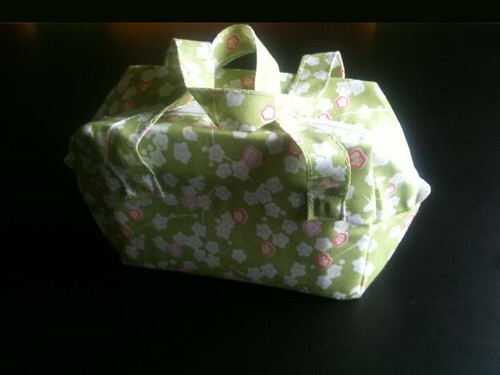 It all came along in my kawaii *** new *** thermal bento bag! 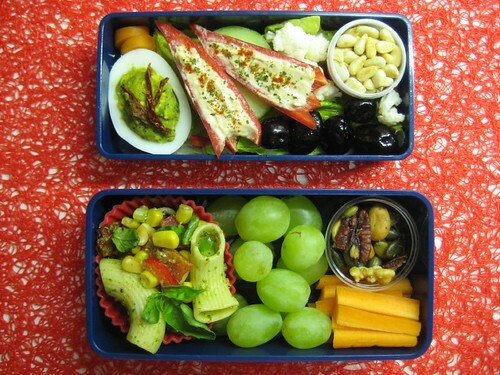 This Monday bento also holds the result of the first two recipes I made from my recently acquired cookbook, La Dolce Vegan! : Sleepy Sunday Morning Scramble (which I indeed made on Sunday morning while I was still rather sleepy) and Roasted Red Pepper Hummus. My oh my, both are quite a success! 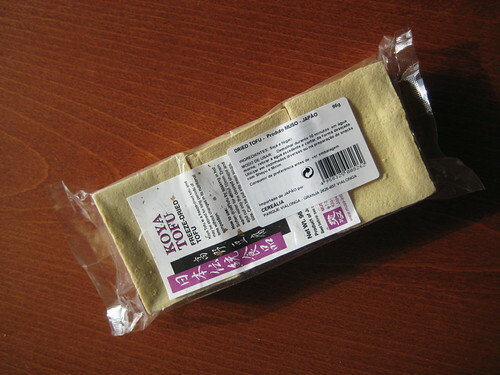 I’m glad I didn’t fill a whole container with just hummus because I would have eaten it all! Dipping my raw veggies (cucumber, green bell pepper, cherry tomatoes), sesame bread sticks and half a slice of toasted pumpkin-corn bread (not shown). The tofu scramble is really nice as well; comforting (which I contribute to the nutritional yeast) though you shouldn’t really expect it to taste like scrambled eggs or anything. 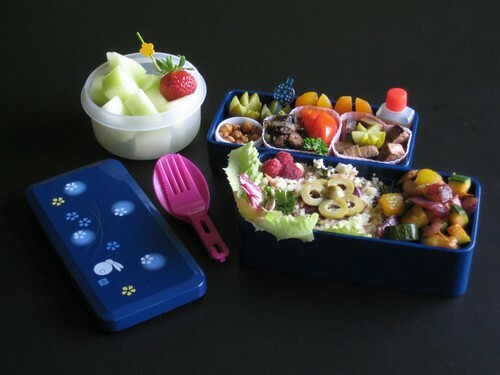 Another great bento lunch to start my vegan week with! 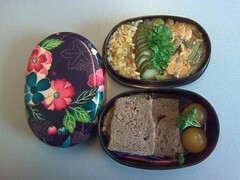 This is my 11th bento of 2011 and they’ve all been 100% animal-free. 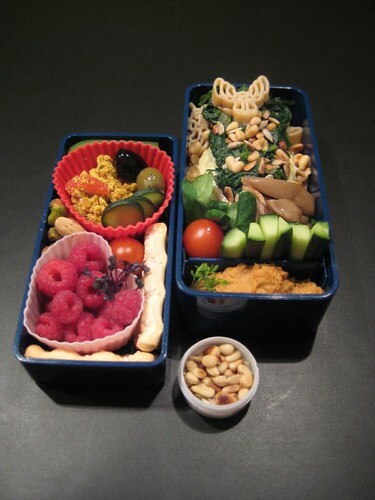 Bunny Bento (#96) and 100 Mile Fitness Wrap-up! You know how it is with rabbits… You start with two and suddenly there’s a whole bunch of them! So, bunnies galore in bento #96. 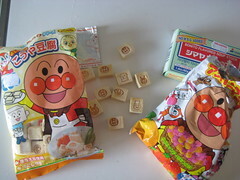 Let’s make it my 2nd entry in hapa bento’s April B.O.M.B. Challenge! 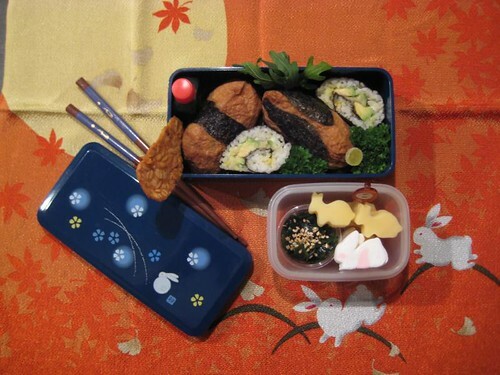 In my usagi sakura bento box you find a Tofu Puff Bunny snuggling up to ordinary inarizushi, a bottle of soy sauce, rucola and parsley greens, a piece of snack tempeh and two avocado maki rolls. Yesh, I made all the sushi myself :) And it was goooooooood. The snackbox contains homemade chuka wakame (seaweed salad), no.1 farmer’s cheese — nationally elected as ‘the best’ — and bunny marshmallows. On the side I had a mandarin and spicy rooibos tea. 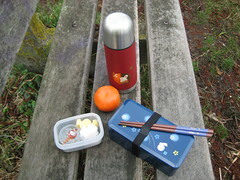 The bunny bento hopped along on my hike today, where it got devoured on a bench next to the water. 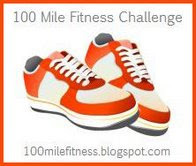 I walked the last 9 kilometers for my 2nd 100 Mile Fitness Challenge! 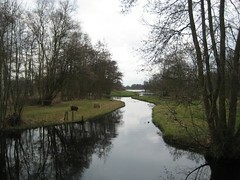 Deadline is tomorrow so I’m right on time :) It was a nice trail called Kortenhoefse Plassen, crossing peat lands. A bit soggy at times ;) I especially liked the end, overviewing the lakes of Loosdrechtse Plassen. So, what’s my end total for the 100 Mile Fitness Challenge? 163 kilometers = 101 miles. Yay!